This Saturday is going to be a fun shopping day in Griffin! 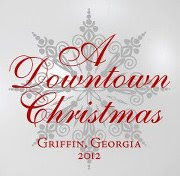 Lots of shops and a few restaurants in downtown Griffin have joined together for a wonderful holiday shopping event. Shoppers who visit all shops will receive a free keepsake ornament, while supplies last. AND receive 10% off at Slices Pizzeria & Bank Street Cafe.